The spire and nave of the famous Church of Our Lady rise to the north of the Market Square, separated from the Old Town by the ring road. It is the youngest church in the Old Town and was built between 1320 and 1475. Here, famous families of master builders like the Ensingers and Böblingers, who also worked in Strasbourg, Ulm, Berne and Milan, created, together with their assistants, an outstanding example of High Gothic in the Swabian region. The stained-glass windows in the choir from about 1330 are of great value. 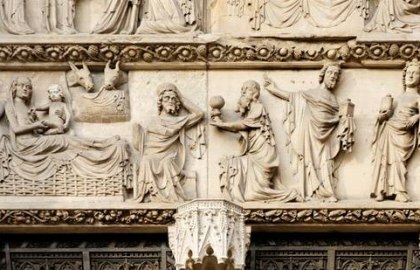 Special attention should also be paid to the extremely beautiful sculptural decoration on the exterior of the portals. Over the west portal there is a depiction of St. George conquering the dragon. 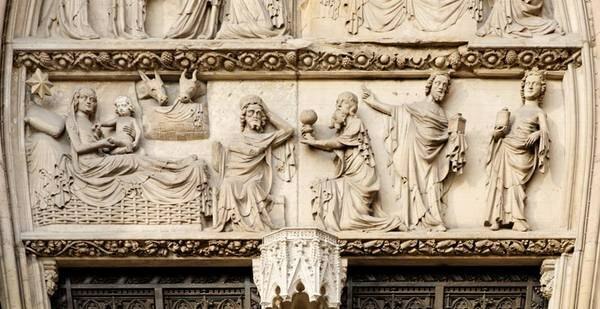 On the south side, the south-west portal depicts Christ as Judge of the World with Mary and John the Baptist at his feet and a very impressive scene of the Last Judgement. The south-east portal shows scenes from the life of Our Lady.